Tag-team transport for range day. 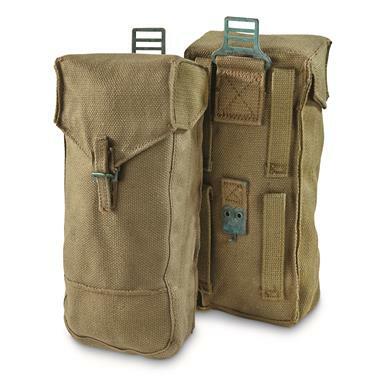 2 Pouches, 1 low surplus price! 11" x 5" x 2.25"
Large and in-charge canvas Ammo Pouches for carrying essential gear in the field or at the range. Just the right size for 30-round AR, AK, FAL or G3 style mags. Made to tough U.S. military specifications. Flap top seals contents from light rain and dirt. These are brand new and ready for assignment on your next mission. Double up your storage for LESS! Order today! Size: 11" x 5" x 2.25"